As did this series from AMC, I would begin commentary on Lodge 49 with the gathering of crows (I prefer to think of them as Ravens). In a previous post concerning the ill-omened crow, I suggested that: “Throughout the ages, birds have been harbingers of fortuitousness... of consequence. Owls, Crows and especially the Crow’s big brother… the Raven… have foretold of ominous events. It is widely known that a gathering of crows is known as a "murder of crows." It may not be as well known that a gathering of Ravens is called a: Conspiracy of Ravens." And Earnie should be concerned… having entered his own Chapel Perilous of doubt, struggling to reconcile the “ways of the world” in trying to make a living in a declining Southern California, with his tarnished dream of becoming the next Sovereign Protector of Lodge 49. So it is that Earnie “plays” the young seeker of the mysteries, Sean “Dud” Dudley (played by Wyatt Russell) for a fool, conning him out of $2K (which Dud can ill-afford), while at the same time, struggling with his own belief in the mystical manifestations of Lodge 49 prophecy and Dud’s ordained appearance. 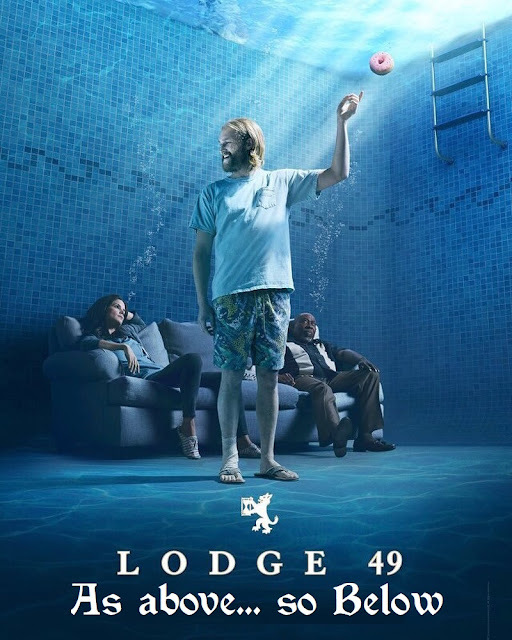 Lodge 49 is both a parody and an illumination of fraternal orders such as the Elks Lodge, the more mystical orders such as the Masons, and the esoteric, alchemical orders, such as the Rosicrucians. It is ripe with the symbolism of the Western esoteric tradition. 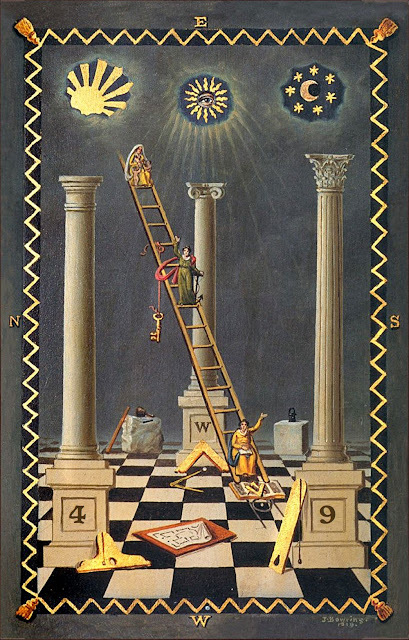 In one scene, an ordinary painter’s ladder is transformed into a golden Jacob’s Ladder, in the eyes of Dud. When he ascends the ladder, he discovers hidden treasure from his past, providing Dud with the answer he is seeking to his worldly dilemma of the moment. 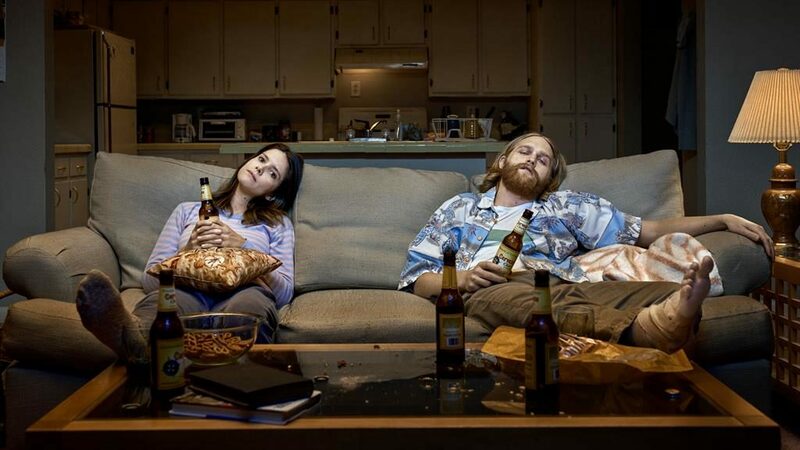 Lodge 49 is a leisurely paced comedic drama, dealing with the mundane as well as the mystery of everyday life. It is a strange brew of cheap beer and esoteric elixir… of routine existence and alchemical transformations. Although Lodge 49 presents a sharp commentary on an American commerce culture in decline, it sparkles with the beauty that resides deep within the commonplace. It reminds us to look for the magick within the mundane. Lodge 49 is a synchromystic smorgasbord. The sometimes generous, sometimes cruel hand of fate is central to program’s theme… the show’s mytharc, if you will. Synchronicities and meaningful coincidences abound. It is the synchronistic interconnectedness of the characters that not only give the show its charm, but is the engine that drives it. The loveable, yet damaged characters encourage us to seek the sublime within the everyday, in our own lives. As a bonus, gratuitous violence is absent from this show. The viewer is not encouraged to seek a game of thrones or fear the walking dead. This is most refreshing in an entertainment industry that seems to only provide mind-numbing, soul-crushing gore to an increasingly desensitized public. Lodge 49 is a quirky program that dares to suggest that we chase the grail, rather than the all mighty dollar. Check out Lodge 49. It is food for thought that also feeds the soul, in a world gone crazy.